Recently, my daughter and I, came through initiation to crocheting. What a challenge! She saw a crochet hook in my needle box when I was searching for a button to replace and she wanted to know what it was. When I explained, she wanted to see how it worked. So we took some yarn and made a ladybug, a butterfly and a dragonfly. 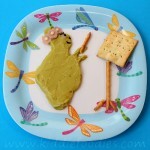 She was then running all over the house to make them fly:) Ended up in the kitchen with a ladybug snack and a big smile! Did you know that the number of spots on the ladybug back does not indicate its age? In fact the number, shape, and location of the spots are all pre-determined by the species of the ladybug. Cut off the top of the cherry tomato - this end will be connected to the olive. Make a ladybug head from the olive: cut the olive in half lengthwise, then take one part and cut a bit, adjusting its height to the tomato. 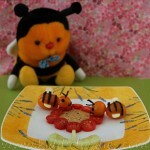 Make 2 holes in the olive head using the straw and place the corn grains inside to make the ladybug eyes. To make it easy start from the inside of the olive and press gently the corn in the hole, until you see it on the outside of the olive. From the rest of the olive, cut small dots using a straw. 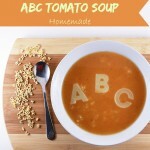 Make small holes (like a "+" sign) in the tomato using a knife and insert olive dots inside to make the ladybug spots. 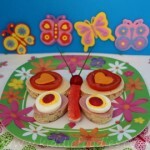 Cut the tomato in the middle in half but only 3/4 lengthwise and open it a bit to make the ladybug wings. Place the olive head in front of the tomato. Insert small pieces of chive between the tomato and the olive to make the ladybug antennae . Repeat step1 and step2 for the second ladybug. 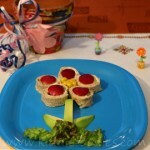 Cut a flower from the orange cheese using a cookie cutter or a knife and place it on a cracker. Cut a smaller flower from the yellow cheese and place it on the bigger flower. Cut three hearts from the avocado using a cookie cutter or a knife and place them on a plate, making a three-leafed clover. Insert chive to make a stem. Cut four small hearts from the avocado using a cookie cutter or a knife and place them on a plate, making a four-leafed clover. Insert chive to make a stem. Enjoy!